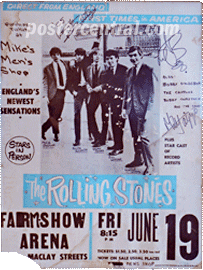 Here are four examples of original, authentic Rolling Stones concert posters from the 1960s. 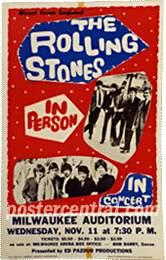 The Stones made frequent use of cardboard concert posters on their first few American tours, from 1964-1966, usually with nice colors. 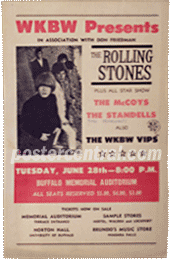 Concert poster collectors covet these Rolling Stones window cards today. I will pay top dollar for any Rolling Stones concert poster of this vintage! 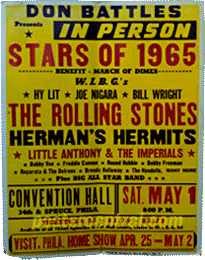 Details on the concert posters pictured above, all original, all printed before the event for the sole purpose of selling tickets: The Rolling Stones in Harrisburg, Pennsylvania on their first American tour, June 19, 1964; The Rolling Stones in Milwaukee, Wisconsin on their second American tour, Nov. 11, 1964; The Rolling Stones with Herman’s Hermits and a host of others at a “one-off” March of Dimes charity show in Philadelphia, Pennsylvania, May 1, 1965; and the Rolling Stones in concert with The McCoys and The Standells, Buffalo, New York, June 28, 1966.